By Jeremy KayFilming began on Wednesday (Feb 1) on Voltage Pictures’ story about the Navy SEAL mission to kill Osama Bin Laden. Cam Gigandet, Robert Knepper, Anson Mount, Freddy Rodríguez, Xzibit and Kenneth Miller will play the special operatives who undertake the clandestine mission.Comment: Add this movie to the two graphic novels already announced. Plus whatever books, plays, TV specials, museum exhibits, etc. will have the codename "Geronimo" in the title. This is an excellent example of how the media perpetuates stereotypes. It doesn't matter that thousands of Indians protested the "Geronimo" codename. Or that military apologists tried (and failed) to justify it. What matters is the overriding message: Bin Laden = Geronimo. In other words, Indians = terrorists. The news reports got the ball rolling. This movie will cement the message. 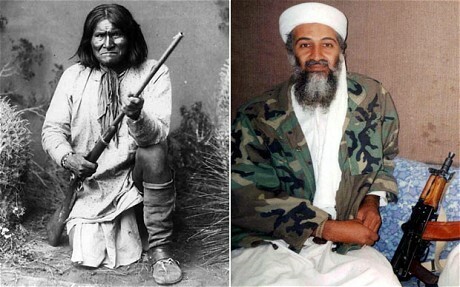 For generations to come, people will associate Bin Laden with Geronimo. They'll continue to think of Indians as murderous savages who fought against freedom and democracy...just like the terrorists. For more on the subject, see Killing Geronimo Graphic Novel and Afterword in Code Name: Geronimo. The point can be made that the name of the operation actually was "Geronimo". A factual presentation of it has cause to use this name... as opposed to pretending that this name was not used. It's not clear what the US intended to name "Geronimo," DMarks. Officials offered conflicting stories on the point. But they (including President Obama) referred to Osama bin Laden as "Geronimo" several times. As you may recall, I covered almost every aspect of the "Geronimo" codename issue. I devoted one posting to the question of whether the mission, not the target, was named "Geronimo." Read it and refresh your memory about my arguments. Even if the mission and the target were named "Geronimo," many titles for a book or movie are possible. E.g., The Hunt for Osama bin Laden, Killing the World's Worst Terrorist, or Avenging 9/11. No way is the codename necessary to convey the subject matter. In fact, the codename is one of the least informative titles possible. It works only because everyone remembers Bin Laden was "Geronimo." Which is my point: Geronimo is permanently associated with a reprehensible mass murderer. Each new account of the mission cements that association.